How are you coping with half term? I’m pretty pleased we’ve reached the half way point 🙂 I love my 3 year old but he talks non-stop from the second he sneaks into bed with me in the morning until his bedtime. Those few hours he spends at nursery each day are a very welcome break but that’s not to say the break from the normal routine isn’t welcome. We’ve been pretty busy with a trip into the West End, story time at the library and lots of baking and crafts at home. 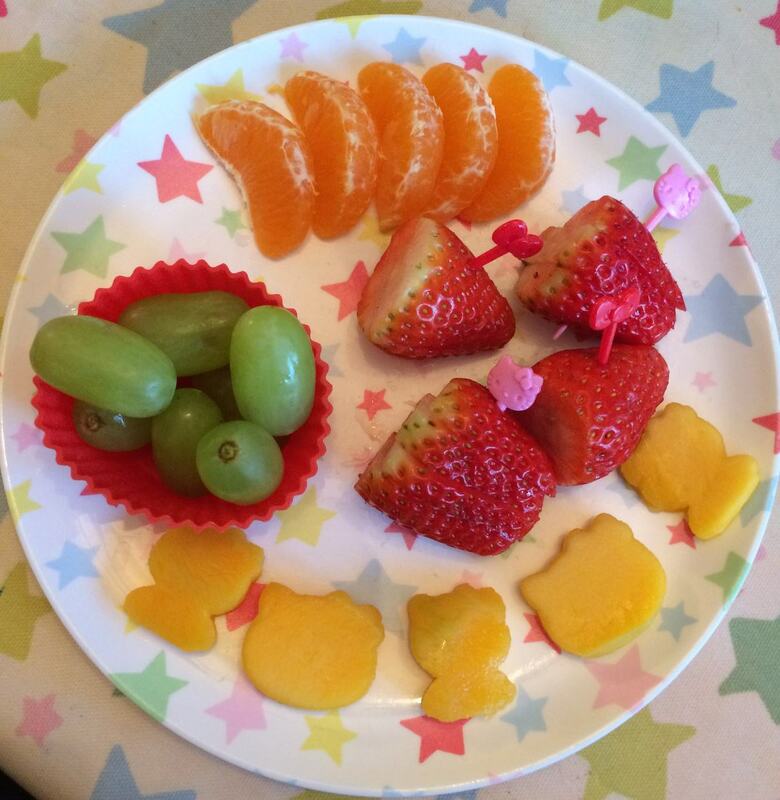 I thought the children needed a boost of vitamins so created a yummy looking Bento-inspired fruit plate for them and thought I’d share it with you. Little Sis adores Hello Kitty so I wanted to use the Hello Kitty food picks and food cutters I recently bought. For their fruit plate first of all I peeled and sliced a mango and cut shapes from it with my Hello Kitty cutter. 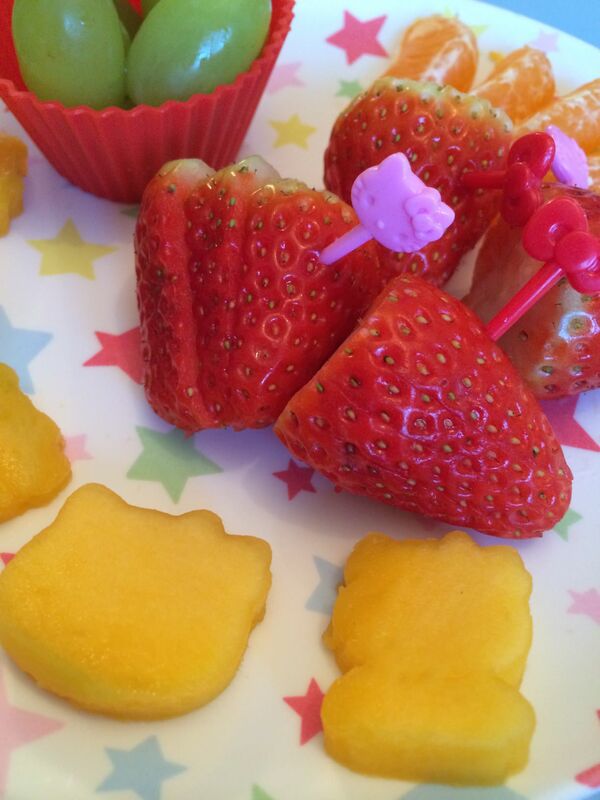 I added pieces of orange and grapes and also finely sliced some yummy strawberries, keeping them in place with the cute Hello Kitty food picks. I was pretty pleased with the results as the food looked visually appealing but I knew was healthy and packed full of flavours too. I quite enjoyed trying something different so I’ve started a new Bento Pinterest board for inspiration! Have you been inspired to make food fun? Fortunately my children agreed and were delighted with their fruit. I used Viva strawberries which are a British bred variety of strawberry grown in the Huelva region of southern Spain and northern Morocco. They are sweet, juicy and full of flavour – very similar to a British strawberry, but are perfectly ripe from February to April, so there’s no need to wait until summer! Disclosure – we were provided with a half term SOS pack, full of activities and treats to enjoy throughout the week as well as the delicious fruit mentioned above. They look such fun and really appetising. My daughter isn’t keen on many fruits – luckily she likes apples and bananas – so I will give this a go. This looks so delicious and colourful! How could children not eat their fruit up with this idea. I really like the idea of the Bento boxes and keep meaning to give it a go. I love what you have done with the fruit it looks very bright and appealing. What a great way to get your kids to eat fruit! That looks like such good fun. Have seen Bento before, but never tried it myself. Must give it a go soon. That looks like a lot of fun. Need to try my hand at Bento soon. I love the Hello Kitty cutter, I wish someone would prepare my mango like that! Oh I wish I had the time or the energy to make food look this pretty! They look like such good fun, my 3 year old would love them! Fabulous selection of fruit, you’re making me crave it! Ooh, I love the Hello Kitty cutters – they’re super cute! I do love kiddie’s bentos, it would be wasted on my 15 year old though lol! 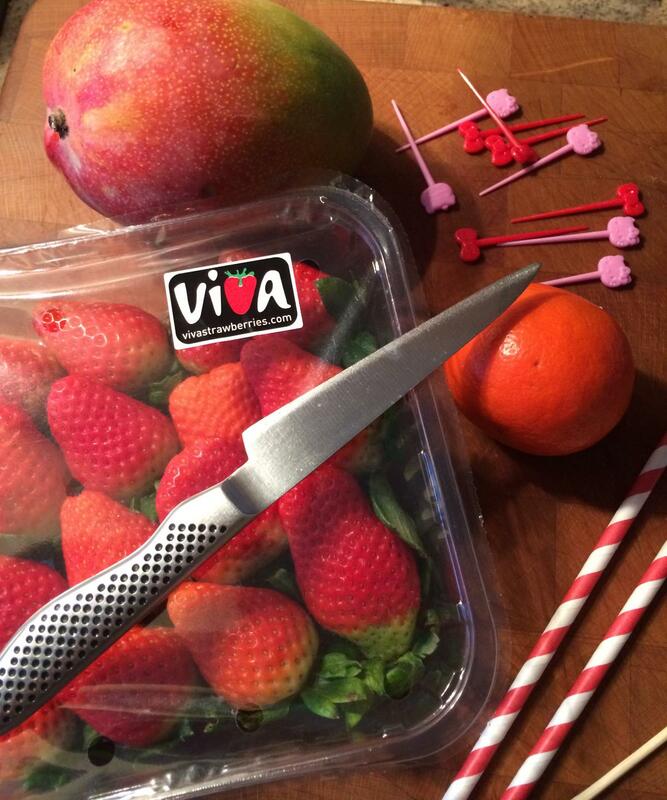 I would happily eat those, great ideas with the cutters for more exotic fruits that children may not otherwise try! I love this! A brilliant way to encourage kids to eat more fruit. I know just peeling and slicing fruit can lead to them eating more, so fun shapes should make it even better! this is so cute! i may have to try doing it one day for myself. Love it 🙂 You must tell me WHERE you got those Hello Kitty cutters from – my daughter is called Kitty and loves Hello Kitty! Just pinned this 🙂 wish someone would make Hello Kitty snacks for me!! I want mu Mango cut like that please. If your two are anything like my one they won’t eat fruit unless there is some novelty hook! Put a strawberry or a blueberry in front of him and he turns up his nose but if I skewer them on a kebab stick he is instantly interested! The fruit food picks look like a safer alternative! If you are interested in bento have you seen the Meet the Dubiens blog? These look amazing, and I absolutely love the Hello Kitty cutters. My toddler has gone off all fruit except bananas and grapes, but maybe he’d be more interested if I tried some fun shapes. I love this idea and perfect timing as we were sat down earlier this evening planning all sorts of fruity treats for the kids lunch boxes when they head back to school next week! 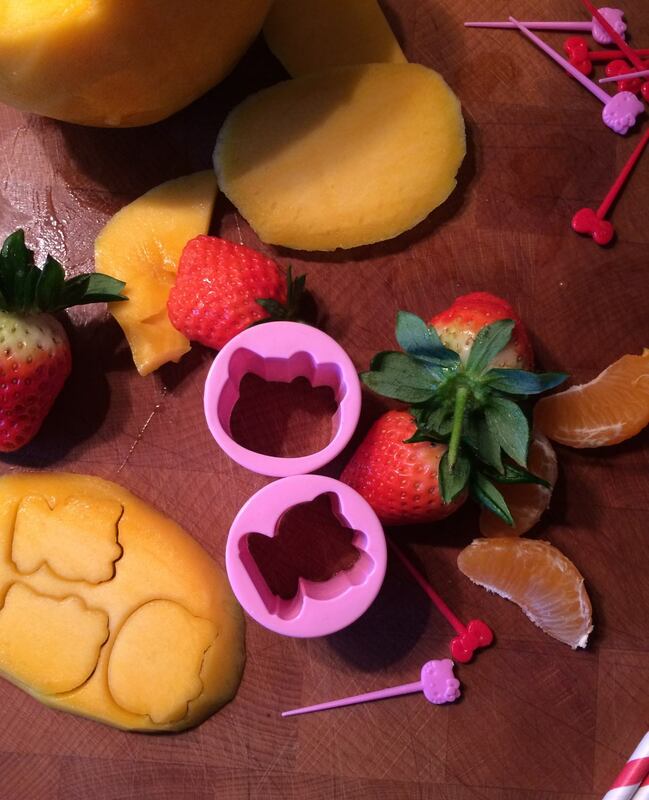 I love this idea – Eliza will only eat sandwiches cut with our butterfly cutter – where did you find Hello Kitty? Such a great idea for the little ones. My two daughters talk non stop too!!!!!! that looks adorable and also delicious! The Boy is very restrictive on what he will and won’t eat fruitwise, he doesn’t like overly slimy fruit which makes things like melon and mango very difficult! Love the way you’ve displayed this. I love this, it looks delicious! Now I need Hello Kitty food picks to add to my collection, we do love our food picks!